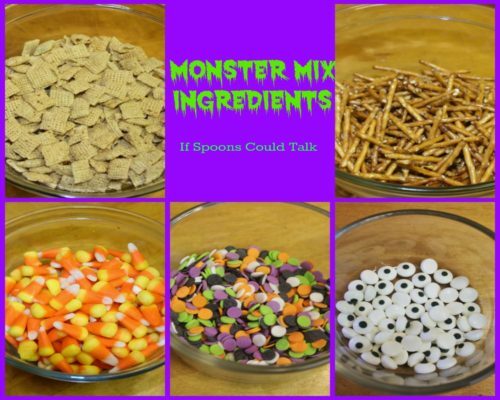 I love a good sweet and salty snack, this Monster Mix hits the spot and is so fun for Halloween. The best part it only takes about 30 minutes to make and the clean up is easy. I was trying to think of a good Halloween snack to have around the house and to take for work when I decided a snack mix would be the perfect thing. After some debating I decided to go with a white trash type mix, meaning I would cover it with chocolate. 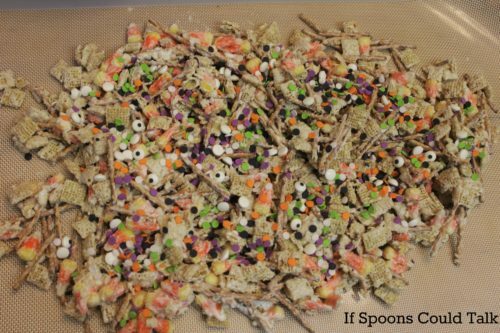 I took my favorite parts of any trail mix, added some candy corn, candy eyes and sprinkles to make it perfect for Halloween. Note I used regular candy corn but later found a mini version which I think would work even better. 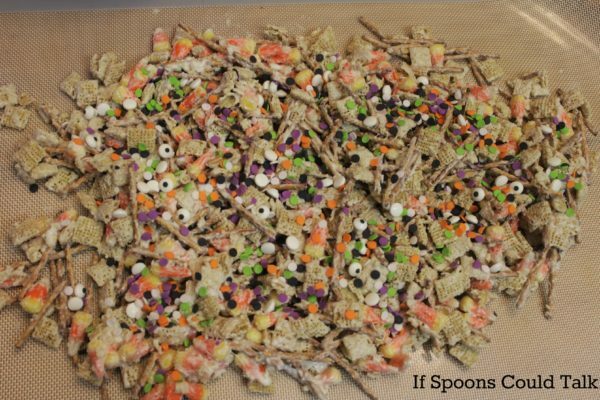 You can also add in other cereal, fall colored M&Ms (I couldn’t find any), or other fall candies that you like. Mix everything together. Then melt a bag of white chocolate chips and mix to combine. Add in half the sprinkles and eyes and mix with so they don’t all end up at the bottom of the bowl. 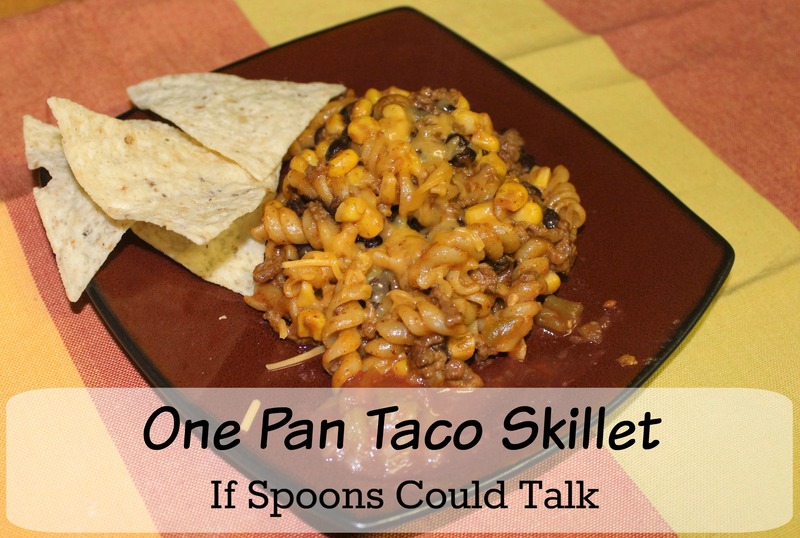 Spread it all out on a silicone mat or parchment paper on the counter or a large cookie sheet. Add the other half of the eyes and sprinkles on the top. Once it has set, about 20 minutes, break into small pieces. 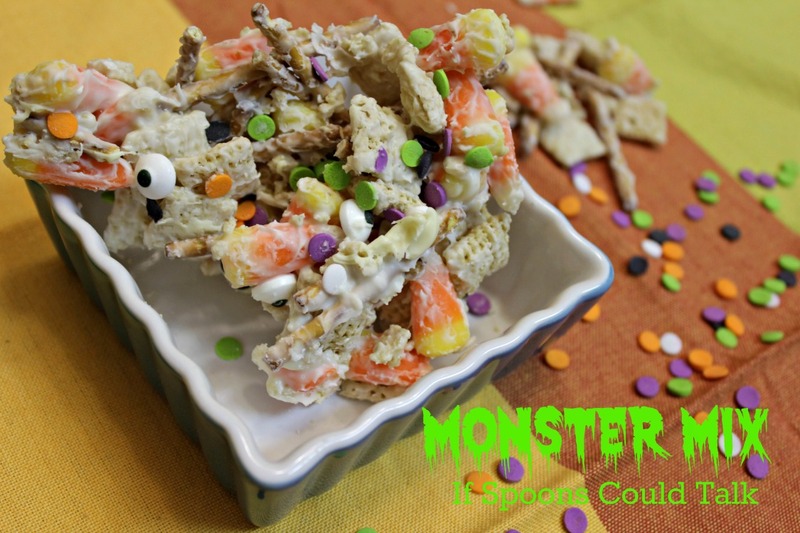 A sweet and salty party mix that is sure to please all the little monsters this Halloween. Adding in a some candy eyes and sprinkles make this mix fun and tasty. 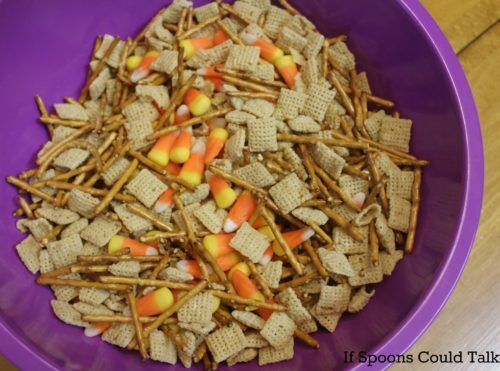 Combine chex, pretzels and candy corn in bowl. Melt chocolate chips as directed on bag. 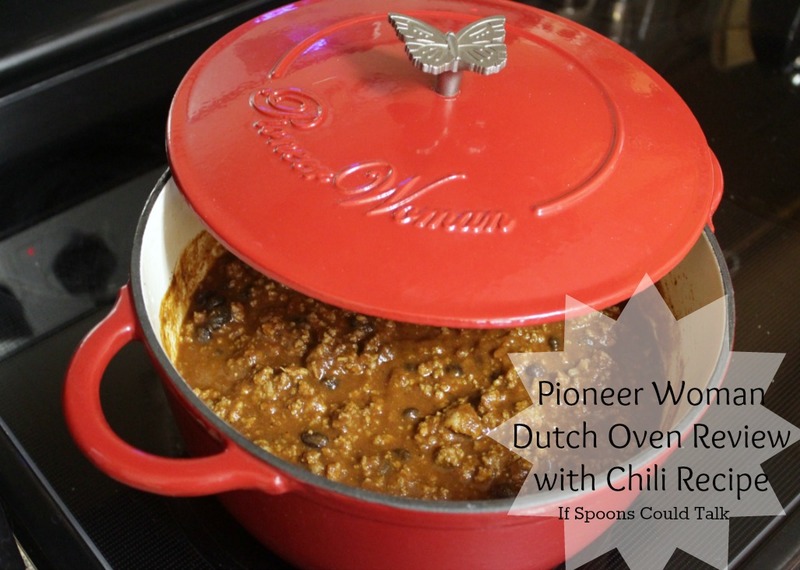 Heat for 30 seconds stir and heat another 30 seconds then repeat in 10 second intervals until smooth. Pour chocolate over micture and stir. Work quickly to get everything coated then add in half the sprinkles and eyes. Stir to mix them throughout. 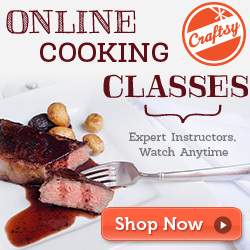 Spread mixture over parchment paper or a silicone mat. Sprinkle remaing eyes and sprinkles over the top. Let sit for about 20 mintutes until the chocolate is set. Break up into smaller pieces. I’m sure this is a big hit! 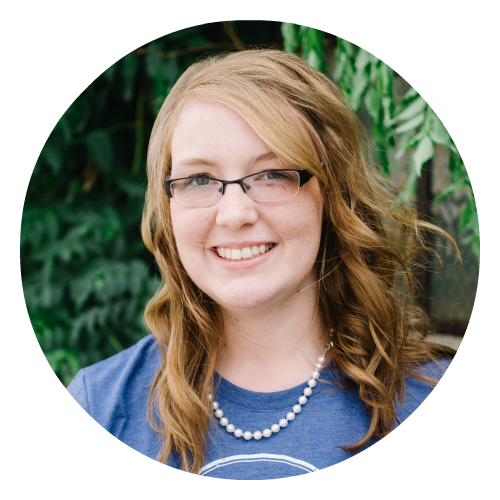 Just want to let you know that you’re featured at this week’s Funtastic Friday. That is so exciting thank you! The little eyeballs are spooky! Great treat!